I recently picked up a copy of Unlock! Mystery Adventures. So far I’ve only played the tutorial adventure, so don’t worry about spoilers or solutions in this post. I’ve tried some real life Escape Rooms over the past few years, and they’re usually fun, though I was so disappointed with Breakout Manchester, that I couldn’t even be bothered to blog about the experience! But as we and our friends get to that age where young children start interfering with the adults’ playtime opportunities, organising a group outing gets harder. 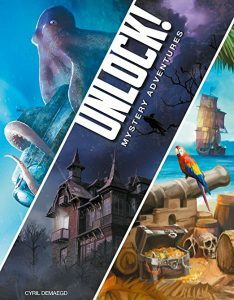 Unlock!, Escape The Room, and the critically acclaimed Exit: The Game series offer the chance to try out the Escape Room phenomena in the comfort of your own home and are more suitable for smaller groups, or even solo play.